Thiruthali Nathar Koil is an ancient temple near Tirupathur bus stand. This is on Karaikudi - Madurai route in Sivaganga district. It is 12 Kms from Pillaiyarpatti. There is a seperate shrine for Yoga Bhairavar. Of the 64 forms of Bhairavar, Yoga Bhairavar is considered to be the most important as he is the Moola Bairavar meaning he is the first. All other Bhairavar's came off him. It is believed that sage Valmiki stayed at this place and also took care of Sita, Rama's wife when she was banished from the kingdom. The Lord Siva here helped his devotee to win rewards from the king by helping him by composing a poem. The Thiruthalinathar temple is a Paadal Petra Sthalam, and Vasuki and Kaarkotakan are said to have worshipped Siva at this temple. Vishnu is also supposed to have worshipped at this temple, and has a place behind the main sanctum, as Yoga Narayana. An interesting feature of this temple is that the Navagrahas are in sitting posture. The belief is that because of this reason, they will patiently listen to devotees! Siva, as Bhairava, killed Andakasura and Sambasura (sons of Hiranyaksha). 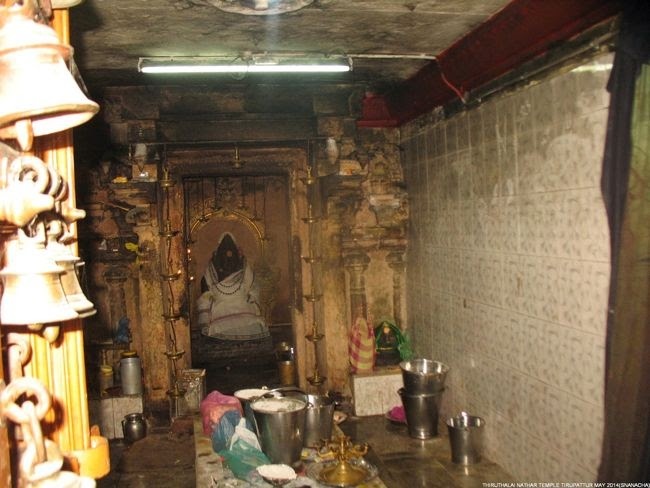 As a penance, Bhairava prayed to Siva in lingam form at this temple. There is a shrine for Yoga Bhairavar at this temple, where Bhairava is alone (ie, without his vahana, the dog). This temple was build during 7th Century CE. This 15-acre (61,000 m2) temple has a main Vimanam with several stucco images on the east side and has 3 piraharams. The concept of Pranavam is said to have realized that Shiva and Pranavam were one and the same here, and it is said to have manifested itself as the Konrai Maram. This is the place of Gowri Thandavam of Lord Siva. Agasthyar and Valmiki worshipped this temple. This temple had got the royal patronage from the early Chola, Pandiya and Chera kings, and by the later period Pallavas, Sethupathy Raja, Maruthu Pandiyar. Hiranyakshkan, a staunch Shiva devotee had two sons Andakasura and Sambasura. Though they were Shiva devotees, they harassed the Devas who sought asylum at the feet of the Lord. Lord Shiva with His Viswarupa killed Andakasura and Sambasura. This form of Lord Shiva is but the Lord Bhairava. Though He killed the evil demons, as killing is a sin, to relieve Himself of this dosha, Bhairava performed Shivalinga Puja in the temple. 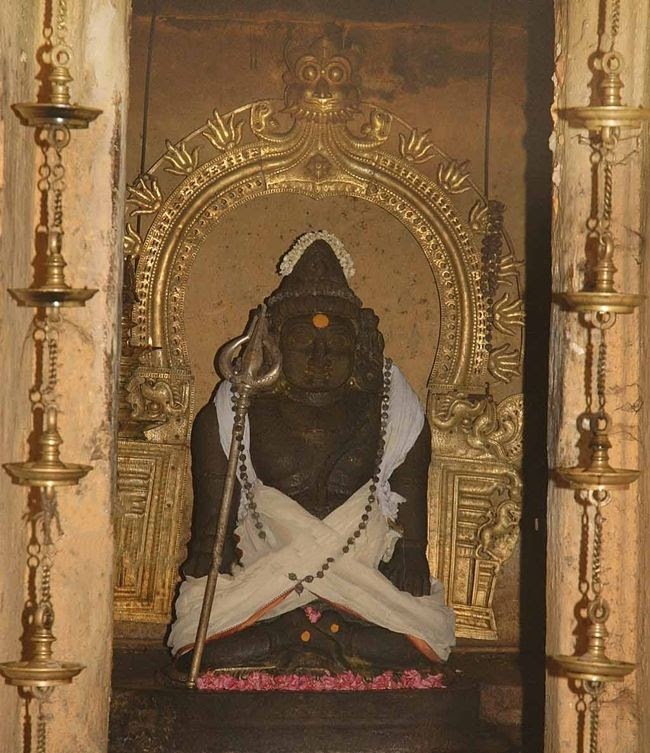 He is worshipped as Yoga Bhairava. Devotees dress Him with white silk vastras. He does not have His dog vahan as He graces here in Yoga form.Those unable to visit specific Navagraha temples, may seek relief in this temple worshipping Lord Yoga Bhairava. He is also praised as Aabath Dharana Bhairava as He rushes to the rescue of his devotees when in danger. On Ashtami days – 8th day of new moon and full moon fortnights, devotees worship here with cosmetic items. A one day festival is dedicated to Lord Yoga Bhairava on the first day of Chithirai falling almost on April 14. He comes in procession on Horse vahan. Ashta Bhairava Yajna is performed for six days during the Champaka Sashti festival in Karthikai-November-December. This is an important event in the temple. Thiruppathur (also known as Thiruputthur) is located in Sivaganga district, and about 23 km west of Karaikudi. In fact, it is on the way from Piranmalai to Karaikudi. This Thiruppathur should not be confused with Tiruppathur near Vellore. 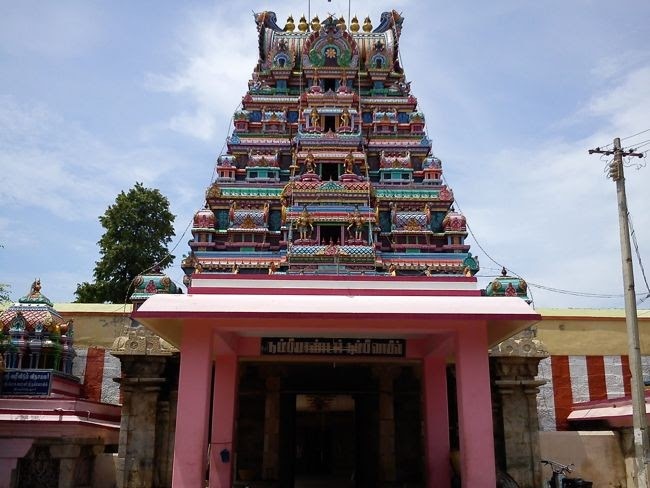 This temple is located in between Madurai and Karaikudi and can be reached by road from both the places. It is located about 65 Kms from Madurai, 20 Kms from Karaikudi and about 35 Kms from Sivagangai.